NEW YORK, Aug 11, 2015/ — Considered the most important issue for a fashion magazine, Details featured 31 Top Male Models on its cover all of them wardrobed either by Calvin Klein Collection, Calvin Klein white label and Calvin Klein Jeans brands. The impressive cover features models Adrien Sahores, Alex Lundqvist, Armando Cabral, Arthur Gosee, Arthur Kulkov, Brad Kroenig, Clark Bockelman, Clement Chabernaud, Daisuke Ueda, David Agbodji, Gabriel Aubry, Garrett Neff, Hamid Onifade, Jackson Hale, Janis Ancens, Jarrod Scott, Jason Shaw, John Halls, Jon Kortajarena, Julien Hedquis, Mark Vanderloo, Mathias Lauridsen, Nicolas Ripoll, Noah Mills, RJ King, RJ Rogenski, Sean O’Pry, Simon Nessman, Tyson Ballou, Vincent LaCrocq and Will Chalker. The cover image was shot by photographer Mark Seliger and styled by DETAILS Fashion Director Matthew Marden. 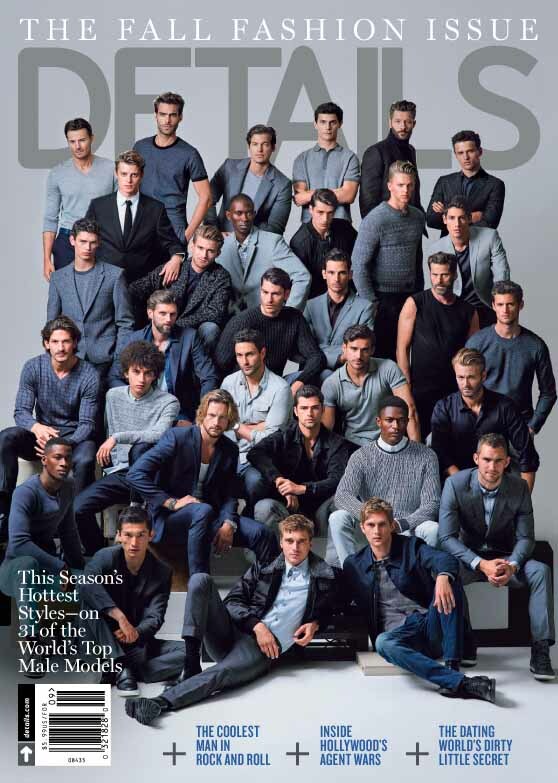 The September 2015 issue of DETAILS magazine will be available on newsstands nationwide on Tuesday, August 18. For more information, please visit www.details.com.